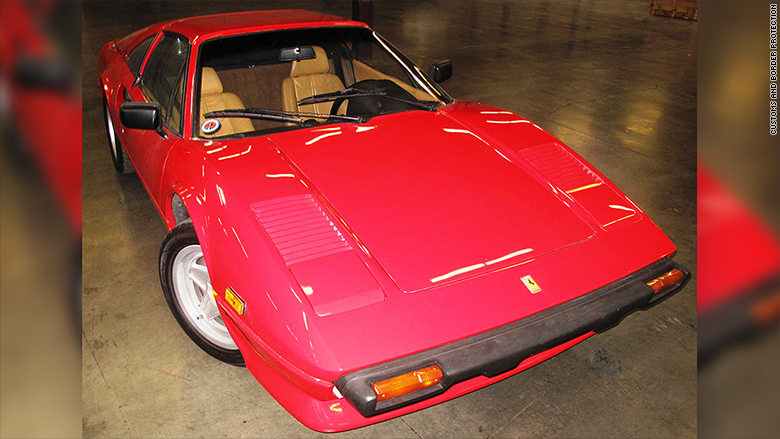 Stolen in 1987, this 1981 Ferrari 308 is worth about $50,000 today. A bright red 1981 Ferrari that was stolen 28 years ago was discovered by federal agents in Los Angeles just as it was about to be shipped to Poland. What tipped off the agents on April 8 was the car's vehicle identification number, or VIN. It had previously been recorded on a 1982 Ferrari 308 GTS that had been exported to Norway in 2005. "This VIN discrepancy is what raised a red flag and prompted further scrutiny," the U.S. Customs and Border Protection said in a statement. Working with agents from the California Highway Patrol and the National Insurance Crime Bureau along with a Ferrari (RACE) factory expert, the agents were able to figure out that the car wasn't quite what the VIN indicated it was. It was actually a 1981 Ferrari GTSi that had been stolen on July 19, 1987, from a consignment lot in Orange County, Calif. The owner was compensated by his insurance company at that time, according to Customs and Border Protection, and now wishes to remain anonymous. The car still has only 45,000 miles on its odometer and is estimated to be worth about $50,000. It was about to be shipped out from the Los Angeles/Long Beach Seaport. There was no immediate word on who was shipping the car out of the country, or who was supposed to receive it.